Via Jacob Rideout on planet KDE, I found this fascinating site with stats about open source projects: ohloh.net. It doesn’t appear that the GNOME stats are ready yet, but interesting nonetheless. Then again, I tend to be a bit of a stat junkie. Since I’ve been hacking on the Nemiver debugger, I’ve been doing a lot of faux-debugging (i.e. start up debugger, step through a few lines, shut down). One thing I noticed very regularly was that there were times when I’d step into a function (usually a function defined in an external library), and gdb would grind away for several tens of seconds at 100% cpu before it finally arrived at the next instruction. Apparently this generally only happens on Debian-based distributions due to the fact that debugging symbols for ld.so are not shipped by default. Installing libc6-dbg solves this problem since this package also includes the symbols for ld.so. But it would be nice if debian-based distributions (in my case, Ubuntu) would automatically install debugging symbols for ld.so as a dependency of gdb, since without these symbols gdb becomes nearly unusable. So if you’ve been frustrated with a slow gdb on Debian or Ubuntu, do yourself a favor and install libc6-dbg. I’ve implemented a list of source files that are extracted from the executable that is being debugged. So you no longer have to hunt around in the file system to open a source file and set a breakpoint, you can now choose from a list of valid source files. There’s actually quite a few new things happening in Nemiver since the holiday break. Dodji added a basic text search, there have been several bugs fixed, and some significant performance improvements. 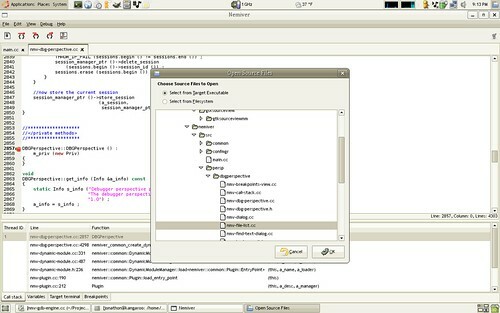 Note that if you want to try out the new stuff in nemiver, you’ll also need gtksourceviewmm from svn. Glad to see the GNOME subversion transition went smoothly. Like Steve, I’ve been thinking about playing around with git-svn since I’ve been fairly impressed with git. I’d be interested in hearing other people’s experiences with git-svn as well.